In our first article, we told you how to know if your sterilizer is working properly. Now we are going to take a closer look at sterilizer maintenance and cleaning. There are many federal, state, and private companies involved in monitoring the safety of sterilizers and autoclaves. Regularly maintaining and calibrating your equipment will ensure that you’re compliant with all rules, regulations, and best practices in the industry. In this article, you will learn how to maintain a sterilizer and keep it fully operational. There are several important organizations that regulate sterilizer manufacturers. The first is the American Society of Mechanical Engineers (ASME). This organization tests every autoclave that has a chamber 6.5 inches or larger to make sure it is safe. The second organization is the FDA. They visit to make sure that sterilizer manufacturers are following rules and regulations. A private organization called UL is concerned with safety and visits the factories it endorses four times per year (http://www.ul.com). Finally, the CDC recommends best practices for sterilizer manufacturers in the United States. These organizations provide guidance and work to make sure that sterilizers are safe. 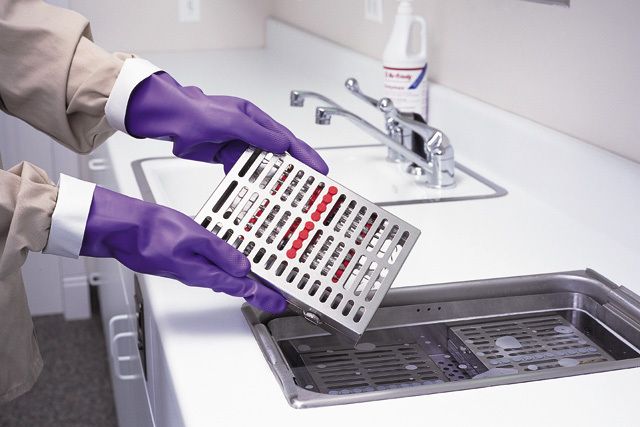 Sterilizers must be calibrated on a regular basis to ensure peak operating performance and cycle time. You must also clean your sterilizer at least once per month, but once per week is best. A poorly maintained or dirty sterilizer will not work properly and will not be able to pass a spore test. The machine itself must be cleaned using sterilizer cleaner. We recommend Alfa Clean because it leaves your autoclave sparkling clean and smelling fresh. Sterilizer cleaner will clean inside the chamber and it will remove buildup from the inside of the pipes. It’s important to use the right techniques when cleaning and sterilizing your equipment. We have developed a step by step infection control method to help you maintain a clean and safe environment whether you’re working in a dental office, laboratory, tattoo shop, or any environment. Wash the equipment with soap, water, and a brush. This will remove gross debris and make your equipment appear clean. Rinse your equipment with clean cold water. Place the equipment in an ultrasonic cleaner with ultrasonic cleaning solution. This will remove the remaining particles on your instruments. Place the equipment in a sterilization bag and run the sterilization cycle. Keep the instruments in the bag until they are ready to be used. We hope that this article has taught you how to maintain a sterilizer and clean your equipment. Remember that regulatory bodies are there to guide you and keep everyone safe. Here at sterilizers.com, we’re committed to safety. That means we’re willing to guide you from the beginning to the end of the process. We’re a sterilizer authority and have experts standing by to answer all of your questions. From choosing a sterilizer to operation and maintenance, when you purchase a sterilizer from us you get lifetime guidance and support. If you have questions about cleaning and maintaining your sterilizer, contact us any time. If you’re interested in purchasing a new sterilizer, we also have experts available who can walk you through the process. Call us at 877-789-9983 to speak to one of our representatives today!